Simon Williams is one of the best (if not the best) trainers on PlayChess. His shows are always very entertaining and I learn a lot from them. Simon has a knack for the attack on the king. Tonight he showed some great Nakamura games. The diagram is one of the positions we looked at. This was not from a Nakamura game but Simon showed it to us because it was relevant for what was to follow. There are some neat tactics involved. The position is quite complicated. 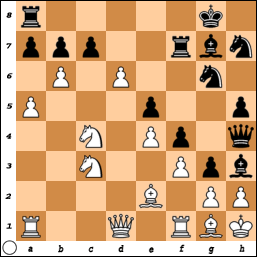 As usual in the Kings Indian white attacks on the Queen side and black tries to force matters on the Kings side. What would you play as white?